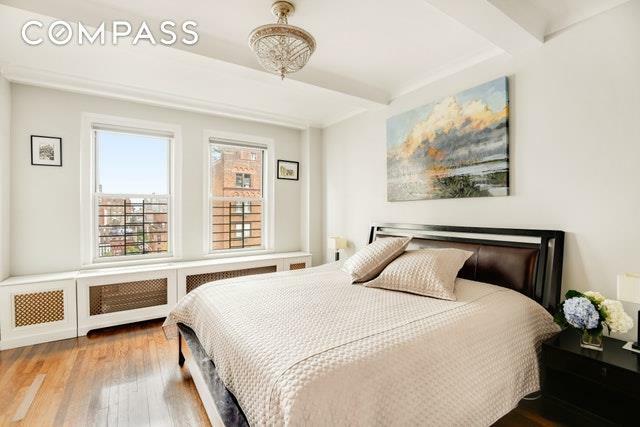 Beautiful & bright Pre-War 2BR / 2BA, 1250SF home with 9-foot beamed ceilings with option to install a Washer & Dryer. This large and sunny home sits high on the 14th floor of this charming Art Deco Pre-War building built in 1928. The home consists of a gracious entry foyer, leading into a dining alcove, a large and bright living room with a wood burning working fireplace, and lots of closets including 2 walk-in custom closets, as well as a large Cedar Closet! 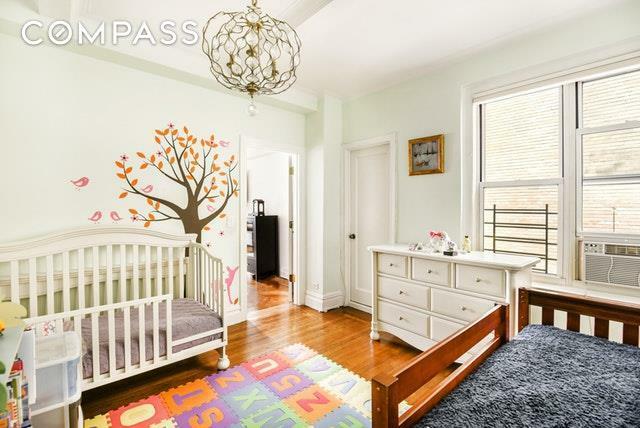 In addition to the beamed ceilings, there are original wide moldings throughout, as well as the exceptionally maintained original herringbone hardwood floors. Brand new double pane sound reduction windows have been installed. The bathrooms are en suite and windowed. There is a windowed kitchen with an AC, granite countertops, stainless steel appliances, and lots of storage cabinets. A storage unit is also available to transfer with the purchase of this unit. The exposures in the home are North as well as East, receiving great natural sunlight throughout. They view out onto open City vistas. 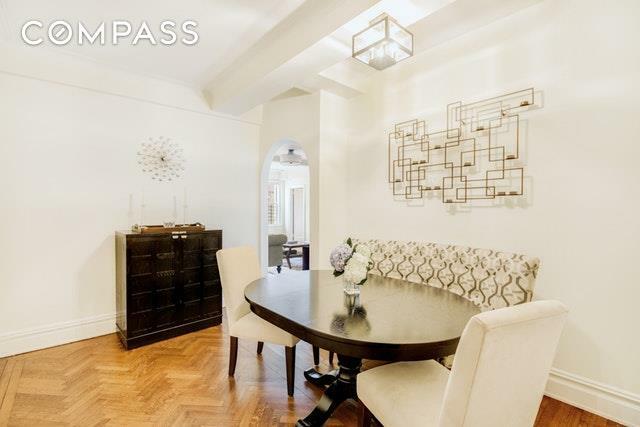 The whole apartment has a classic pre-war layout that lends itself to the charm and grandeur of old New York! 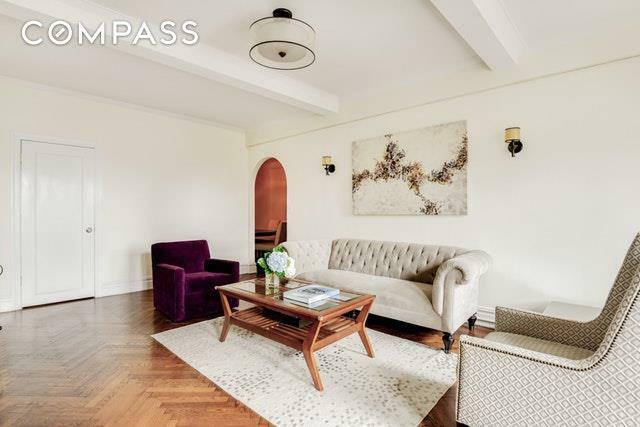 There are just 6 apartments per floor in this full-service, boutique, 1928 Art Deco Pre-war building with a full-time doorman, live-in super, package room, storage, bicycle room, laundry room and a stunning rooftop deck outfitted with benches, tables, chairs & umbrellas. Pets and pied-a-terres are welcome. It is located in lovely Sutton Place close to all transportation, parks, Whole Foods. This home is move-in ready! Listing courtesy of Asees Anand of Compass.